Formally known as the Ally Program, the Safe Zone series includes several trainings designed for UCF faculty, staff and students who have an interest in learning more about and becoming an advocate for the LGBTQ+ community. The program was created by therapists at Counseling and Psychological Services (CAPS) for those interested in showing visual support for lesbian, gay, bisexual, transgender or questioning (LBBTQ) persons at the university. 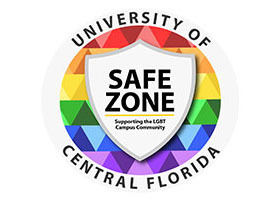 The UCF Safe Zone series is delivered in several parts, including: LGBTQ+ 101, Safe Zone Advocate Training, Coming Out Workshop, and the Gender and Orientation Language Diversity Workshop (GOLD), with 2 separate tracks for faculty/staff and students. Members of the LGBTQ+ community, allies, and people wanting to learn more about LGBTQ+ issues are encouraged to attend the UCF Safe Zone trainings. For more information visit the UCF Safe Zone website.